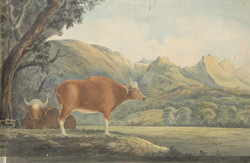 Water-colour drawing by John Johnson of a water buffalo taken from a sketch-book of 36 drawings (36 folios) depicting scenes chiefly in W. India and Mysore, dated c.1795-1801. The wild water buffalo is the ancestor of the domestic water buffalo, which is now found in most tropical and subtropical regions. It originally ranged from eastern Nepal and India, east to Vietnam, and south to Malaysia. The interbreeding with domestic buffalo, the loss of habitat due to cultivation, large-scale poaching and communal hunting have drastically reduced the wild buffalo population which is now under severe threat. The wild water or Asian buffalo is a massive and powerful animal. It is dark brown in color, with short, sparse hair and has broad, flat, notched horns. It is found in wet grasslands and marshes, near pools and near large rivers. These animals are very dependent on the availability of water and are primarily grazers and, when not feeding, spend the majority of their day bathing and wallowing.